The mention of edible flowers reminds me of a book and a film. The first one is the book Love in the time of Cholera by Gabriel Garcia Marquez where Florentino Ariza eats so many roses that he makes himself sick on receiving a letter from his beloved Fermina Daza. And the film is Monsoon Wedding by director Mira Nair where Vijay Raaz’s character of the wedding planner, P.K. Dubey consume a Marigold flower when he realises he loves Tilottama Shome’s character, Alice, the maid of the house. As innocent and weird as these instances may be, they remind me of the cultural connection of flowers to the feelings of love and passion. And if there is one flower that is associated with love across cultures, it is the Rose! Nair’s Monsoon wedding uses Marigolds in the film as if it were a Rose. Both Gulab and Gendha (Rose and Marigold respectively) are often mentioned in song lyrics and poetry in the Indian subcontinent. Whether you enjoy edible flowers or not, certain flowers have always been culturally more symbolic than others. Culinarily, one finds roses more often than the Marigold. Rose petals and hips are seen in jams, puddings, drinks and as crumbles. The use of rose in food can be considered posh by some and is often reserved for special occasions. 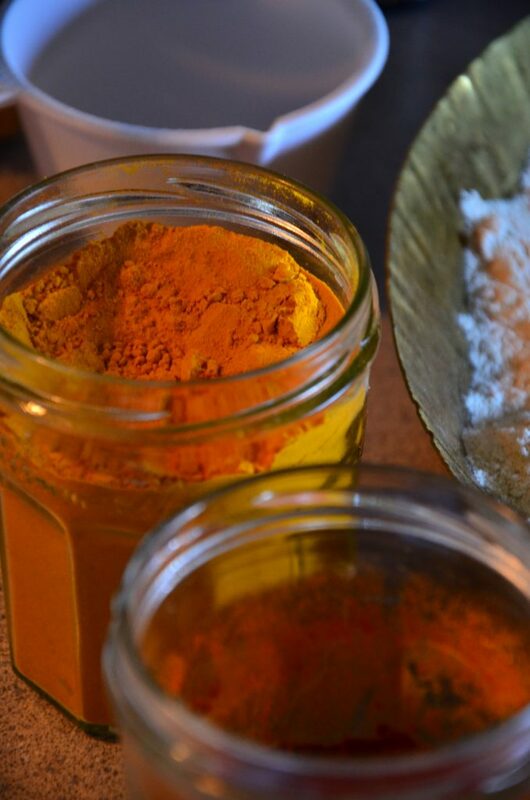 My recent experiments with this fragrant plant has been in making Gulkand – Rose petal jam, Rose tea and Rose Kheer. As for the Gendha, I will explore it some other time. 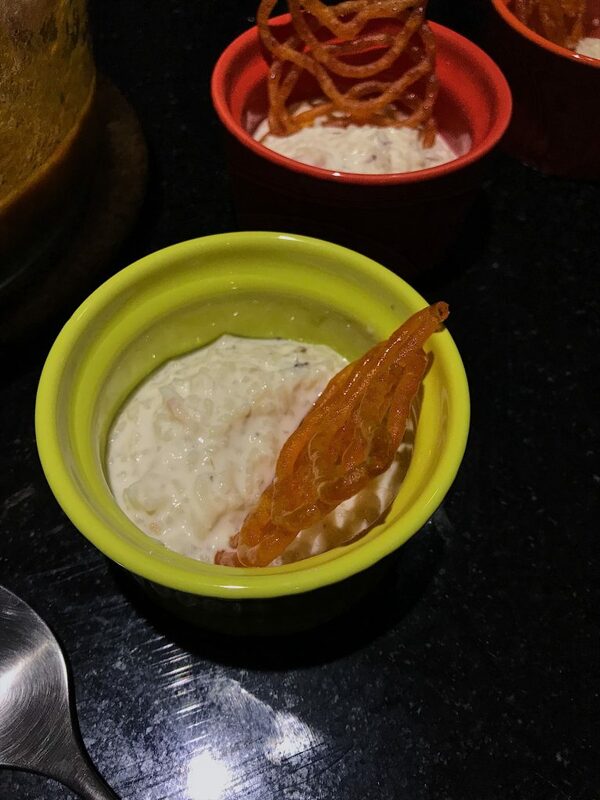 The idea came when a friend placed a recipe request with us for a Rose Kheer she had recently tried. Now fresh rose petals are fairly common to find in India. The desi gulab variety of fragrant small roses is often found in abundance at flower shops outside temples and shrines for offering to gods. Some basic research on the desi gulab told me that the Indian Desi gulab variety comes from the Persian Damask rose variety. And sitting in Dubai, while I would not easily find the fresh desi roses, I knew that I would definitely find the Damask roses in one form or another. The Dubai Spice Souq sells a variety of dried flowers for teas. But I did not see myself go all the way to Old Dubai and eventually managed to get dried roses at a local Dry fruit kiosk in a supermarket. I only needed a small amount as a little goes a long way when it comes to rose flavour. I could have easily bought normal roses from a flower shop but I find them purely ornamental with no fragrance as compared to the Desi or Damask Rose. Most recipes I found for Rose flavoured desserts used Gulkand or the Indian Rose petal jam that is often used in Sweet Paan (Betel leaf). 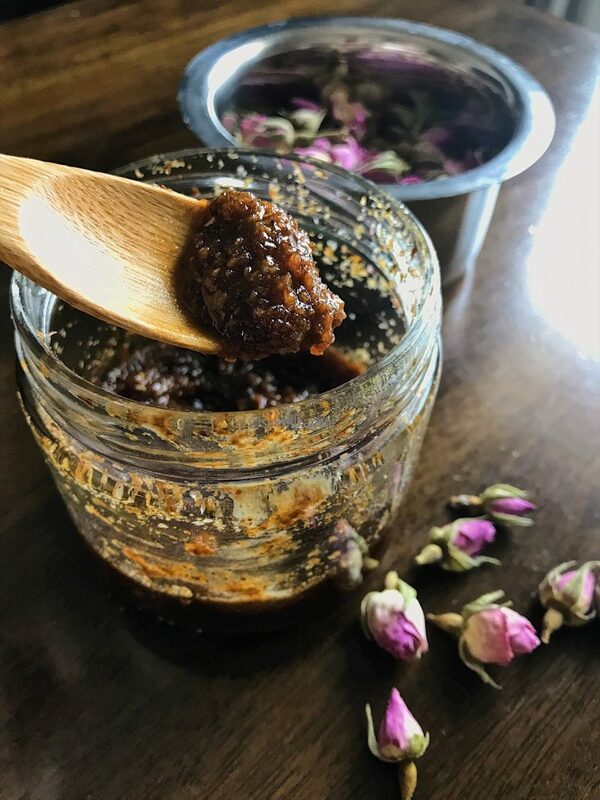 Gulkand is a relatively simple jam that is made by layering fresh rose petals with equal amount of granulated sugar and some citric acid or lime in a glass jar and letting it cook in the sun for a few days or weeks. The two recipes that I consulted were from Anita Tikkoo of Mad Tea Party and another from Sangeeta Khanna of the blog Benaras Ka Khana. Both Anita and Sangeeta used fresh petals of Desi Gulab while I was stuck with dried rose petals. What followed were weeks of anticipation where I would look at my Rose petal jar, open it and take long sniffs and imagine what it might look like in another week. However, it did not work the way I imagined it to be. I started by disintegrating the rose petals from the dried buds to collect half a cup’s worth. Next, I measured an equal amount of white granulated sugar and transferred it with the dried rose petals in a small food processor jar. Then, I pulsed these together to make a coarse mix. It smelt heavenly. Since I did not have any citric acid crystals as mentioned in Anita’s recipe, I squeezed in the juice of half a lime and mixed it well. The dry petals could definitely use some moisture that I thought the lime juice would provide. I left this mix in the hot Dubai summer sun for 10-12 days and the sugar did not melt. Why? Probably because there was no moisture content in the Rose petals to dissolve the sugar. After waiting for more than a week, I finally brought the jar inside and decided I would cook the mix on the stove top to melt the sugar. I placed the Rose petal and sugar mix in a small non stick pan and cooked on low heat by stirring constantly. When I saw that the sugar still didn’t liquify, I added a tablespoon of water (gasp!) and more lime juice. After cooking for another 5 minutes on low heat, the sugar finally disintegrated and resulted in a liquid mass. This, my friends, was my version of the Gulkand. I was hesitant to call it Gulkand at the time but almost a month later, it has finally come together. The texture and consistency is not as syrupy and it is drier but it still tastes great. 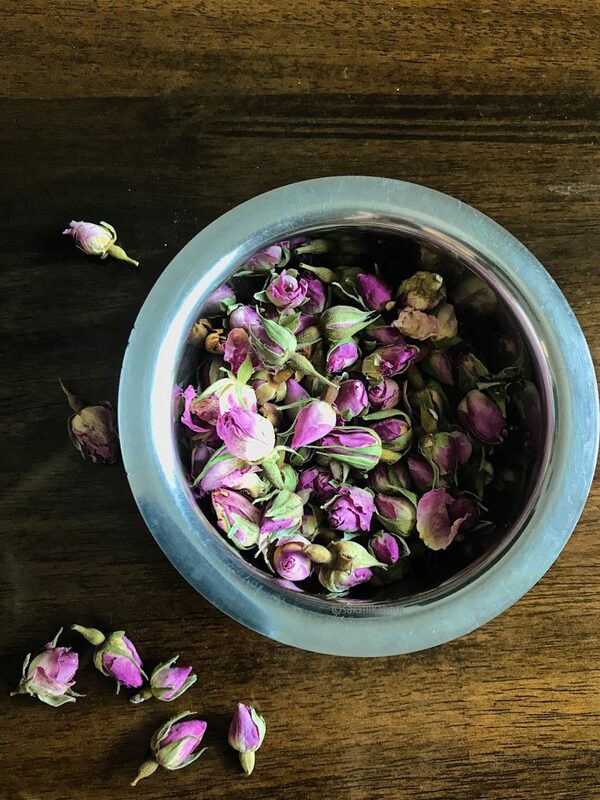 While I will work to refine the recipe for making Gulkand with dried rose petals, you will be relieved to know even a freshly made rose petal preserve on the stove top is good enough to impart flavour for making Rose Kheer. You may refer to Anita’s and Sangeeta’s respective Gulkand recipes linked above. Start by rinsing the measured rice in cold water 3-4 times and then soak the rice in filtered water for at least half an hour. You may soak rice much earlier before you move on to the next step. In a heavy bottom saucepan, pour the milk and let it cook on low heat. Stir occasionally to take care that the milk doesn’t boil over. When the milk starts simmering, drain the soaked rice and transfer it to the saucepan. Stir and let the rice cook in the milk till the grains are soft. Keep the heat on low throughout. Add the crushed cardamom at this stage. Stir the Kheer occasionally to check that it doesn’t stick to the bottom. After letting the milk simmer for almost an hour, the milk would have reduced and thickened. Add sugar, a small amount of Gulkand/ rose petal jam and stir everything to incorporate. Cook for another 10 minutes till the sugar dissolves. The Gulkand will change the colour of the Rose Kheer slightly. At this stage, when the Kheer is almost cooked, add a tablespoon’s worth of dried rose petals and stir them in. Now take the Kheer off the heat and let the rose petals steep in. You may adjust the flavour of the roses by adding more rose petals and Gulkand. But adding more Gulkand will also sweeten the Rose Kheer further. You can taste and change the quantities according to how strong you want the rose flavour to be. Finally, add a few drops of rose essence or rose water and stir it in. 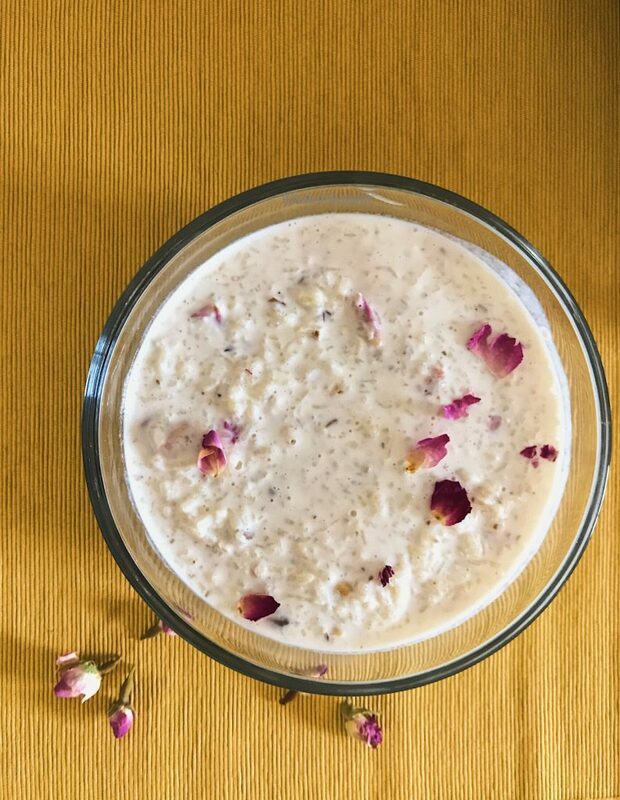 Once the Rose Kheer cools to room temperature, you can transfer it to the fridge to chill. Chilling the kheer also thickens it. Serve this delicate Rose Kheer chilled or warm with some Jalebis and share with your loved ones for an exotic sweet treat. In a heavy bottom saucepan, pour the milk and let it cook on low heat. Stir occasionally to take care that the milk doesn't boil over. Add the crushed cardamom at this stage. Stir the Kheer occasionally to check that it doesn't stick to the bottom. Cook for another 10 minutes till the sugar dissolves. The Gulkand will change the colour of the Rose Kheer slightly. At this stage, when the Kheer is almost cooked, add a tablespoon's worth of dried rose petals and stir them in. Serve this delicate Rose Kheer cool or warm with some Jalebis and share with your loved ones for an exotic sweet treat.